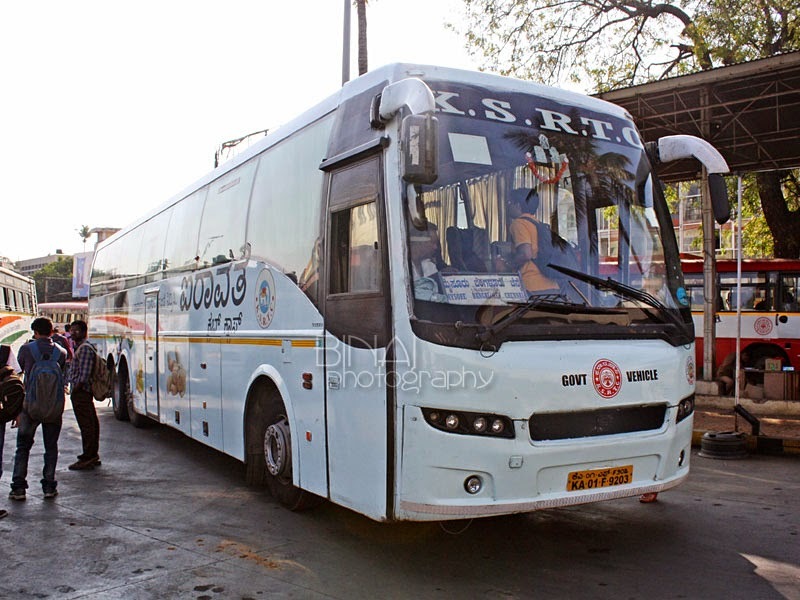 24 hours on road: KSRTC Lovers journey through Kannur and Wayanad! "You don't have any other work??" This is a question any bus lover would've got atleast from one person. This is precisely the question I receive everytime I announce my plan of a busfans trip at home. This trip was no different. A member of our core team of bus nuts was getting relocated to the Middle east - the Gelf of the Malayalees! We all wanted to make one quick trip with our beloved friend. 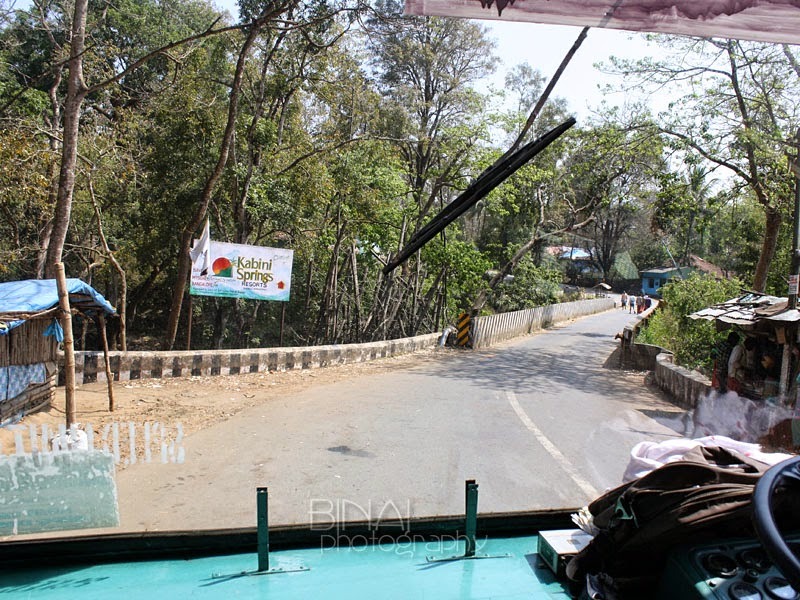 A lot of options were drawn - we wanted it to be a ghat route, where KSRTC has operations. We had two options - one in the South and another in the North. For some reason, everybody unanimously decided to go north. We decided to travel Kannur-Mananthavady-Mysore. There are two main routes from Kannur to Mananthavady - one via Palchuram and the other via Nedumpoil. While we haven't be on either of the routes, we decided to go with the former - the one via Palchuram. 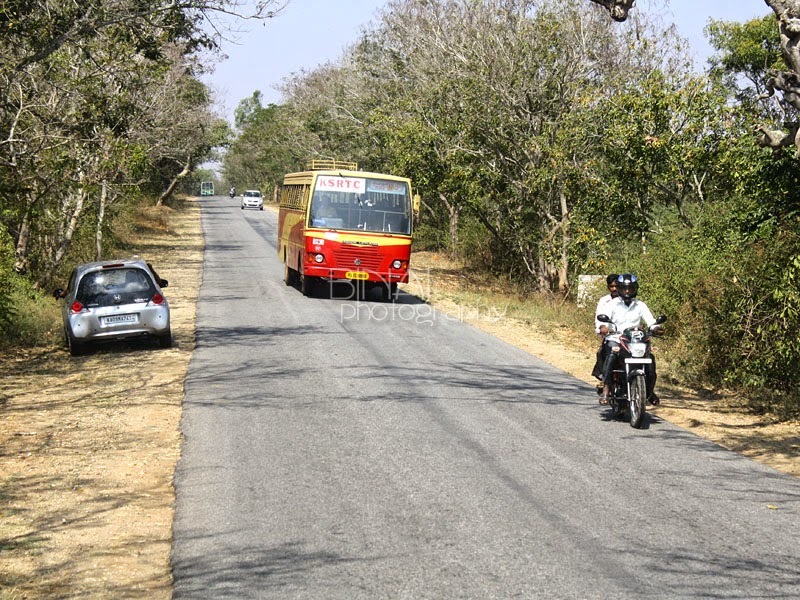 There are two routes for Mananthavady-Mysore as well - one via Kutta-Gonikoppa and the other via Bavali. The former is the route frequented by night buses, while the latter is open only between 6AM and 6PM. So it was the latter, obviously. The final plan was: Kannur-Palchuram-Mananthavady-Bavali-Mysore, from where the team then disperses. Since all this requires only a day, we decided to keep it on a Sunday. The trip was fixed for February 01, 2015. I was being joined by Aneesh from Bengaluru, while the rest of the team will reach Kannur directly (primarily from Trivandrum). I was quite eager - this was my first long bus ride of the year. 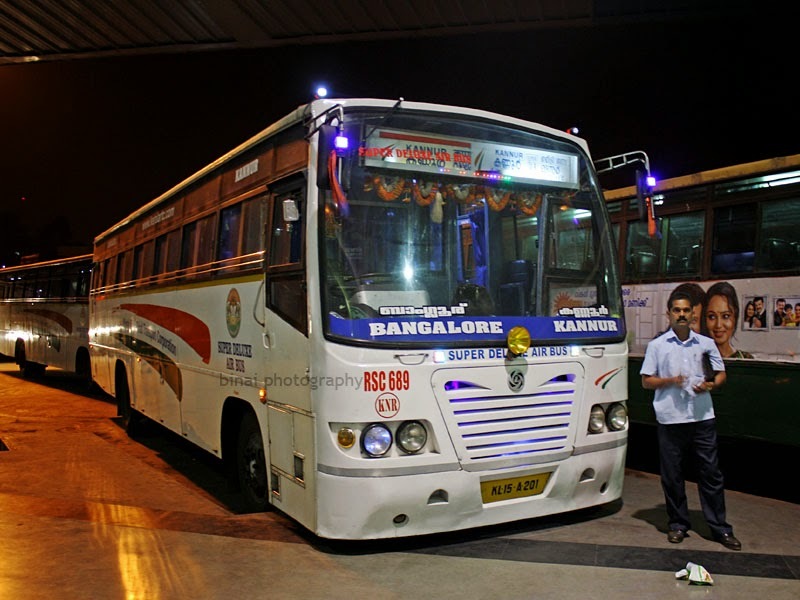 We were taking the 2115hrs Bengaluru-Kannur Super Deluxe of Kerala State RTC. I had been following up the reservation statistics of this bus since the day the trip was planned - the bus was empty all through, and we decided not to take a reservation. Both of us were at Satellite Bus Station on Mysore Road, Bengaluru by around 1930hrs - for another reason. After a quick dinner, we were all set to ride the Kannur Deluxe. RSC689 of Kannur was doing the honours - the first impression about the bus was great. Not a single dent or scratch on the body - the bus was decked up tastefully with LEDs, and some multi-colour ribbons. The conductor stood outside the bus - as if acting in an award movie, he wasn't uttering a single word or calling out for passengers. RSC689 of Kannur preparing to start from Satellite BS, Bangalore. We got into the bus, and took two window seats on the right side of the bus. The bus started exactly at 2115hrs from Satellite BS - with a total of about 10 passengers on board. There was a small block inside the bus station - we exited the bus station around 2119hrs. Traffic kept our progress slow - road cleared up after Kengeri. The driver was really quick - he kept good speed on the Mysore road. I was expecting a dinner break at Channapatna - but we rolled past Channapatna. By now I was getting sleepy, and dozed off. I woke up as the bus was leaving Mysore Bus station (around 0003hrs) - I tried hard to decipher the route we took, but sleep overpowered me, and I fell asleep again. I vaguely remember the conductor announcing a dinner break - I was too sleepy to get off the bus, and I just continued sleeping. Sometime around 0130hrs, Aneesh wakes me up and breaks a news to me - we have a puncture! I was still sleepy - it took me sometime to decipher what was happening - the crew was doing something at the back (the rear left, inner tyre had a puncture). They were unable to remove the tyre or get the spare tyre from its place. They were attempting to get a spare tyre from another bus of Kannur depot (a Super Express, which departed Bengaluru after us). But the bus was on the other side of the road, and they were lazy to get it here. In the meantime, another bus of Kannur depot came - this was a Super Fast (also from Bengaluru). So the crew sent off the Express and decided to get a spare tyre from the Super Fast - as soon as they said this, the Super Express just sped off. They came to the super fast, and found that the super fast did not have a spare tyre!! I now understood that we were stuck in the middle of no where! The driver of that Super Fast thought real quick - he called up the Super Express crew and asked them to stop wherever they were - he said he'll drop us there. Finally at 0142hrs, we set off in the Super Fast (RSE626) in hunt of the Super Express. This bus was full, and we had to travel standing. Finally, at 0200hrs, we reach the Super Express. We finally got on to RAK724 - this bus had a few empty seats here and there - I took one near the rear door, while Aneesh took one on the last row. The express guy started immediately. This was a five year old bus, still being flogged on an interstate route. I struggled hard to catch up some sleep - the driver was absolutely rough on speed breakers and wouldn't let me sleep. I remember seeing Virajpet (around 0330). I had wanted to be in Kannur by 0530 - now I saw all the plans going down the drain. I was too tired, and fell asleep after Virajpet. I woke up every time the bus stopped to drop passengers - the stiff back rest was taking a toll on me, for sure. Our team-mates from Trivandrum were at Thalassery - and they decided to wait for us there. They joined our bus at Thalassery (sometime around 0535hrs). It was an eventless journey then on till Kannur - we were dropped at Kannur Old Bus Stand at around 0600hrs - leaving us with exactly an hour to go for next bus. We had a mad hunt for a lodge for us to get fresh - we found one a bit away. It was a mad dash then for everyone to finish their morning chores and get ready. We were back at the Old Bus Stand at 0700hrs exactly - and our next bus had just come in. Now, RAC700 of Kannur depot was all set to take us to Mananthavady, via Kottiyoor, Palchuram. The journey started a bit late - since some of our team-mates were late. We occupied all the front seats - the crew were friendly right from the beginning. The bus initially ran through the NH, till Chala - then turned off towards Koothuparamba. The bus was crowded for most of the time. We had a one minute halt at Koothuparamba - by now, some members shifted to the bonnet, and we all crowded the front. 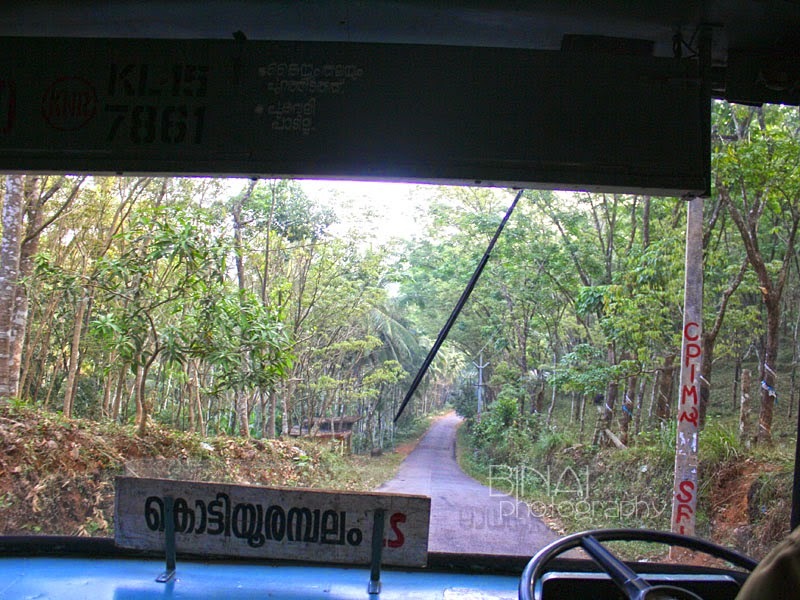 After Koothuparamba, we turned on to a really narrow road. It was an interesting run - a narrow road, through an area resembling central Kerala, with typical Malabar styled houses. I really do not remember the names of the places we went through - but it was an amazing ride. We landed at Peravoor on the hill highway. From here the road got a bit wider. We passed through Kottiyoor - even made a brief halt outside Kottiyoor temple. Kottiyoor is a very famous temple in northern Malabar region. Things became greener after Kottiyoor - it was a very hilly region with tea plantations around. 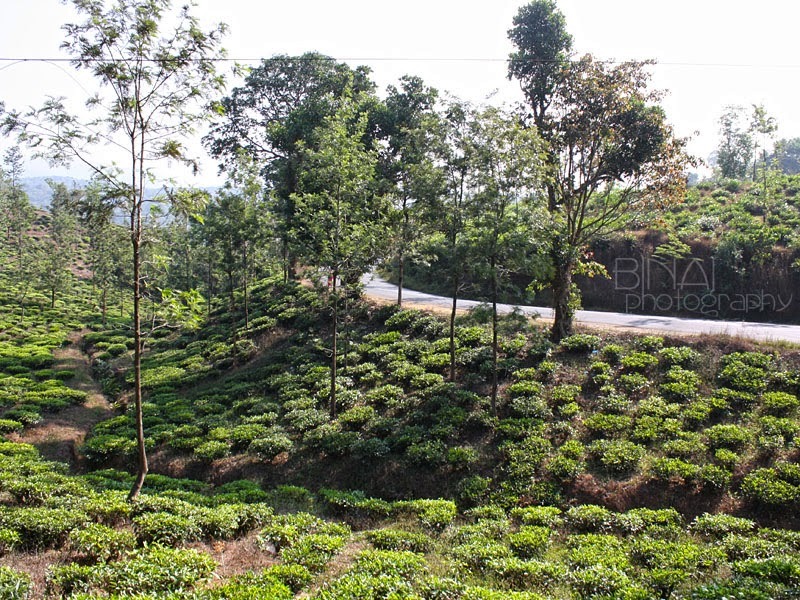 I never knew so many tea plantations existed in Kerala. Then began Palchuram. 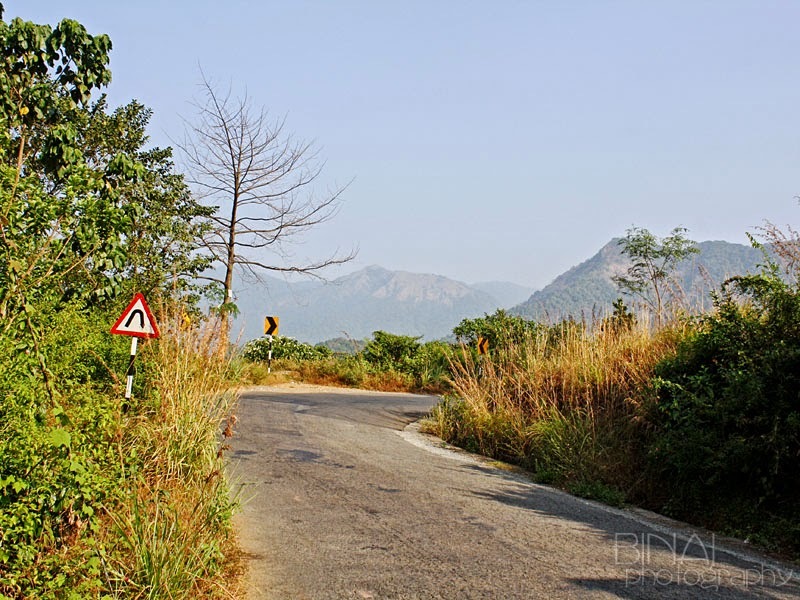 Palchuram is a small ghat section - with 5 hairpin bends, but a very twisty route. There is a famous waterfall at Palchuram - we couldn't visit the place, though. We passed Boys town and Thalappuzha, and reached Mananthavady sometime around 1015hrs. 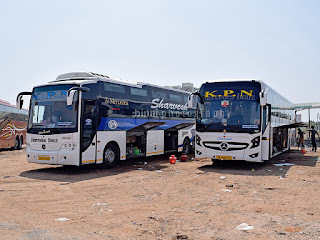 As we were nearing Mananthavady, we had an estimate of where we could find eateries, and decided to proceed to the KSRTC depot - where, the driver said, an employees canteen would serve some breakfast. We were dropped at the depot sometime around 1020hrs. Mananthavady is a small depot - its very small. 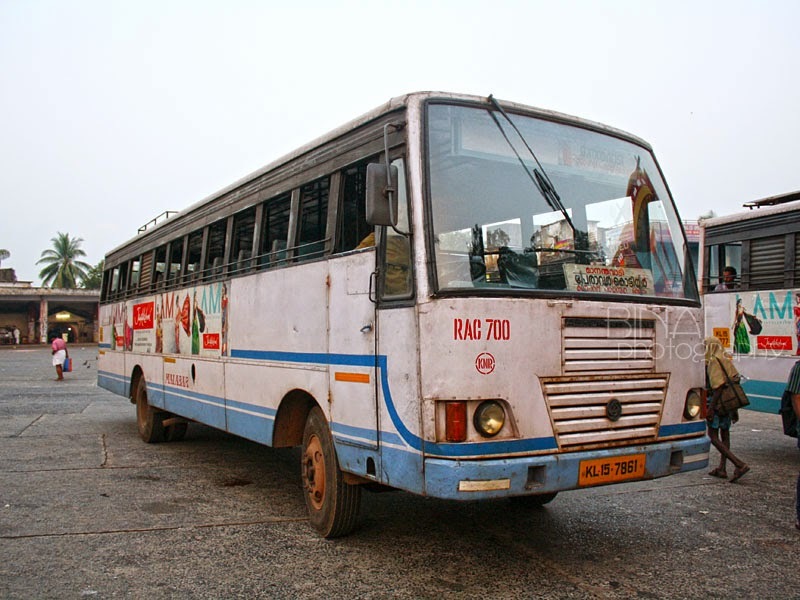 Hardly does any passenger come there to board buses - everybody uses the Panchayat bus station in the town centre to board buses - these buses go there to pick-up passengers. We rushed to the canteen at the bus depot to have our breakfast - as expected, only the official item aka Malabar Parotta and another item was available. I opted for Parotta - it was soft and tasted good. After breakfast, we decided to click some pics - but the security guard expressed his displeasure and requested that we clicked from outside. In the meantime, he did not forget to canvas us for their depot's bus to Mysore (which we were anyway about to board). We had close to 30 minutes to spend before our next bus would start. Sometime around 1110hrs, our next bus - RAE594 of Mananthavady - pulled out from its parking place, took us in and set off towards the Panchayat bus station, where the service officially begins. 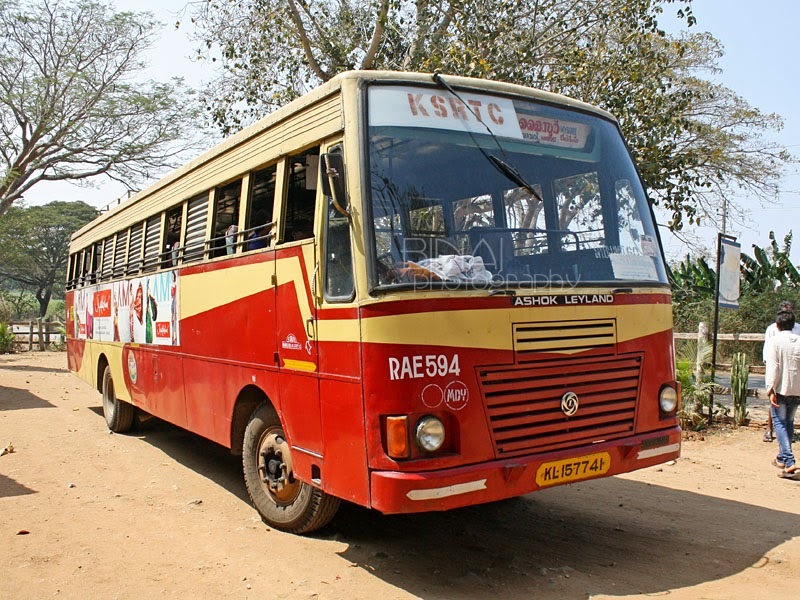 The Panchayat bus station is a small area - where KSRTC and Private bus jostle for space. We too began the crowd, and found our sweet parking spot at the corner of the bus station. The moment the bus parked, people mobbed and got in - the bus surely had a lot of takers. We had a somewhat longish break there - in the meantime, a lot of KSRTC buses rolled in. ILMK's Wayanad member Aju Varghese also gate crashed into our party - he did not travel with us though. The bus started perfectly on time, at 1130hrs. 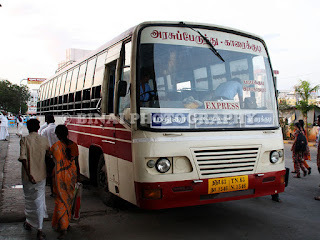 The bus took off towards Kattikulam. The section after Kattikulam is new for me - the bus takes off towards Bavali from there. The road runs through a forest - it was dry and hot. 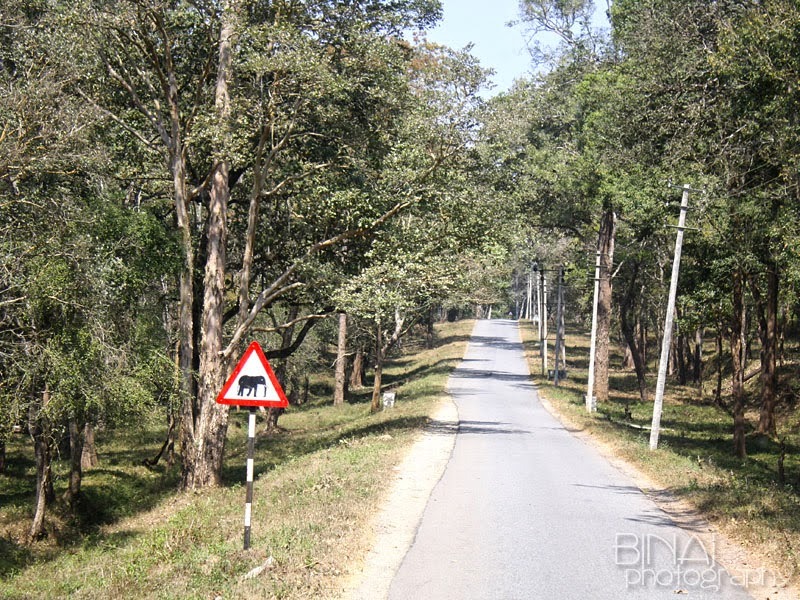 The Kerala-Karnataka border was inside the forest at a place called Bavali. Running through the forest section past Kattikulam..
Like most borders, here too, a small narrow bridge marks the territory. 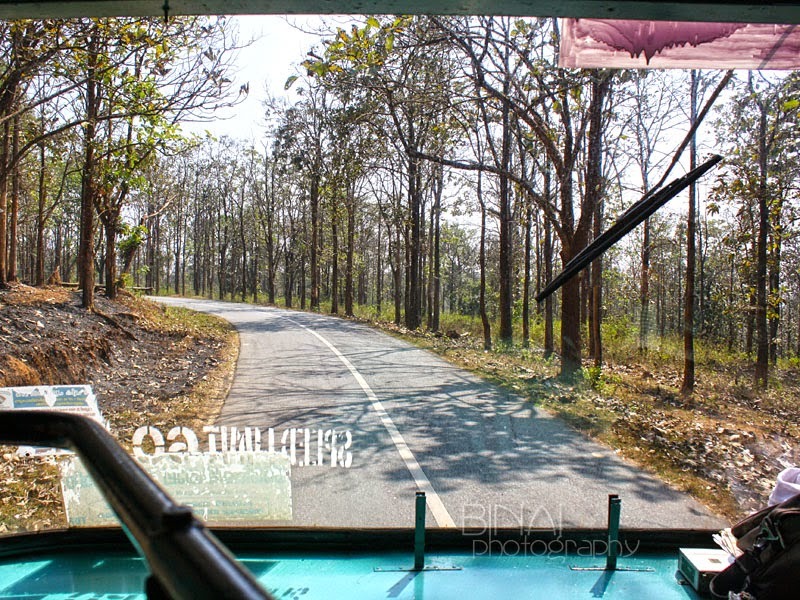 After the border, the road enters in to Rajiv Gandhi National Park (more commonly known as Nagarhole National Park). The road gets narrow, but is well paved. In some places, road widening is in progress. I did not see much wildlife except for a few deers on the roadside. The bus stopped for lunch after exiting the national park, sometime around 1315hrs. The hotel was a typical road-side shack which sells things at exhorbitant rates - we decided not to have anything from there, and carry on to Mysore. We had a late breakfast anyways. We spent the time taking pics and then got back to the bus. The break was about 30 minutes long. There are only a handful of KSRTC buses this way - so not much of spottings either. It was getting hot and very tiresome - I had a short nap after we started from lunch break. 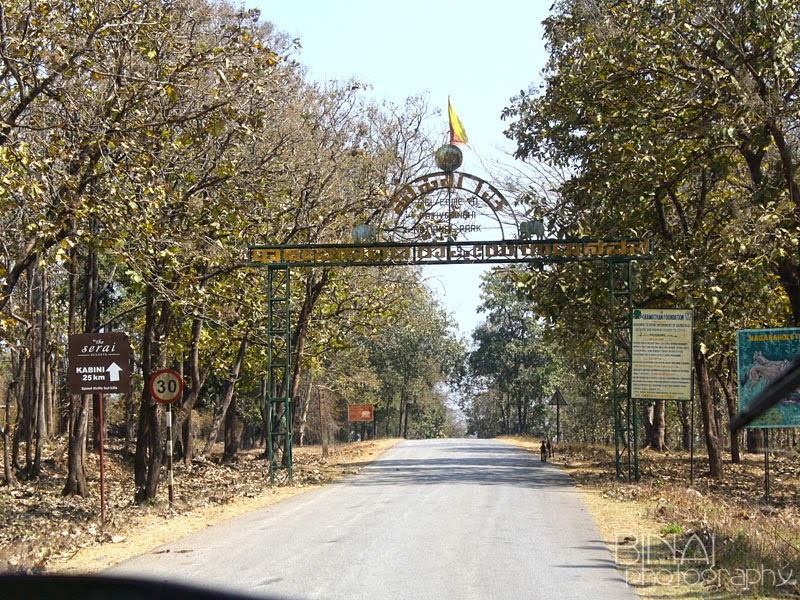 Entrance to the Rajiv Gandhi National Park.. The road after exiting the National Park. I remember passing through Handpost, a place near Heggadevanakote (HD Kote). The driver kept constant pace - the bus was getting old as well - it huffed and puffed as we travelled towards Mysore. We were finally dropped at Mysore bus station sometime around 1450hrs - the driver was slow in the last stretch - reportedly, that was purposeful in order to reach Mysore correctly on time. It seems they have parking issues at the bus station, and ensure that they reach just in time, so that they could head directly to the platform. We got off the bus and bid bye to the crew before heading out for lunch. After a sumptuous lunch, we were all back in the bus station - two of us were travelling back to Bengaluru while the rest of the team was heading to Sulthan Bathery. 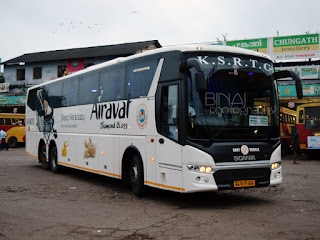 I and Aneesh had decided that we'd take an Airavat Club Class, so that we could rest for sometime - a Kerala RTC Deluxe (Nilambur to Bangalore) came in, but we stood by our decision. Sometime later, an Airavat Club Class from Mysore Rural-2 depot rolled in, with a board reading "Mysore Bangalore Chennai" - probably a special service, since there are no scheduled services at that time. The bus was mostly full when we got in, and got seats towards the rear. We left Mysore at 1610hrs - I slept off soon after the bus left. I vaguely remember someone occupying the seat next to me (I think that was at Mandya). I woke up just as the bus was entering Bangalore city limits. Most of the bus emptied at Satellite BS, while we continued to Shantinagar. We were dropped outside Shantinagar bus station at 1949hrs. Oh yes!! I do remember.. Sad we did not know each other!